All season long the Cardinals have been better on the road than at home. That trend stayed true on Sunday in Chicago, as a huge first half for Kurt Warner paved the way for a big Cards 41-21 win over the slumping Bears. Warner threw four first half TDs, and ended the day 22-for-31 for 261 yards with five scores and a QB rating of 135.9. The Cards improve to 5-3 on the season, and rebounded nicely after their loss at home a week ago to the Carolina Panthers at home. Arizona ran away with the game early, going up 14-7 at the end of the first quarter, the scoring 17 second quarter points to lead 31-7 at the half. Chicago heard plenty of boo’s on their home field, as the team was beat up badly a week after the offensive struggles continued despite a win over the awful Cleveland Browns. Jay Cutler, who was forced to throw almost every down in the second half, was 29-for-47 for 369 yards with three TD’s and a pick. Greg Olsen hauled in all three scores for Chicago, catching 5 balls for 71 yards with the three scores. The Bears run game again wasn’t very good, as leading rusher Matt Forte ran for just 33 yards on five carries. 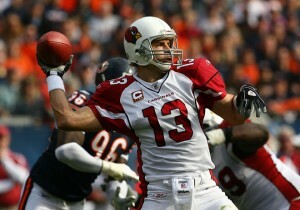 On the day the Bears were outrushed by the Cardinals 182 to 70. Warner found his favorite target, Larry Fitzgerald, often in the game. He had 9 grabs for 123 yards and two scores. Steve Breston, playing in the second WR role for an injured Anquan Boldin, had five catches for 66 yards and a final score that put the Cards up from 34-21 to 41-21 with 4:30 left. The Cards will look to put the home blues, where they are just 1-3 this season, behind them as they play the Seahawks next week.